Image credit: North American Brewers Association. You might say there's something to be said for session beers, at least considering the fact that two local breweries brought home medals in session beer categories from the recently-completed North American Beer Awards. Put on as part of the annual Mountain Brewers Beer Fest in Idaho Falls, Idaho, judging for the 2018 North American Beer Awards took place May 29-June 1. Entries were evaluated according to the 2018 North American Beer Awards Style Guide, with criteria based on "classic, historical and well-established styles of beer, as well as recognized industry advancements updated to reflect the marketplace." In terms of results, a total of 297 medals were awarded in 99 different categories. North Texas winners are noted below, with a complete list of medalists to be found by clicking here. Bronze for Go Easy in the Session-Style IPA category. Gold for Adiós Pantalones in the Session Beer category. 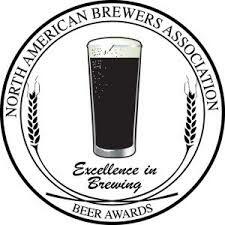 Bronze for Ugly Pug in the Schwarzbier (Black Beer) category. Cheers and congratulations to HopFusion and Rahr & Sons!